Our current thinking about sustainability limits our opportunity to achieve the results needed in the short timeframe we have to turn the tide. We need to change that thinking and the leadership to do it is most likely to be found at the local level, rather than the national or global. Harness that local initiative, and the kind of big change that now seems impossible will quickly come to seem inevitable. Much of the current large-scale focus on sustainability is what those who lead change refer to as first and second order change. Consuming less, conserving more, creating less waste are considered first order change, which asks us to make adjustments to what we are already doing. Second order change is a low-level system change such as manufacturing hybrid cars and generating more wind or solar power.What we need is third order or transformative change. This level of change requires us to integrate all aspects of our lives, bringing our thinking into alignment with reality. Rather than see life and work as separate ways of being engaged, or schools and corporations as separate systems, we see them as an embedded whole. If any aspect is not healthy, the other parts will deteriorate. The best environment for transformational change to occur now appears to be at the level of community. The full engagement of citizens along with robust collaboration among education, community, business, and government organizations can rebuild our communities into places that foster personal well being, are supported by well integrated institutional structures and care for the environment. This work is more likely to happen in city councils than in Congress, and among neighborhood groups than lobbyists. Local activists, governments, and communities have the opportunity to lead the way by developing a sustainable system for themselves…becoming both a part of the solution and a proof of concept. That’s a big responsibility – but step by step, local communities are proving themselves up to the challenge. Sustainable Novato is an example of a community organization that is working to engage the local business community in conversations that build a thriving local economy and create an alliance of local businesses that support each other through a mutual rewards system. It looks at Novato’s future in a holistic way, bringing together initiatives to support locally owned business and promoting a strong fiscal base for local government with measures supporting clean, renewable energy and bayland preservation. Educational institutions have as great a part to play as community groups. The recent proliferation of green MBA programs is an encouraging sign – but even the greenest MBA programs are challenged to achieve the desired sustainability results using business models that contributed to the problem. 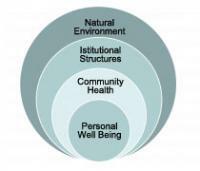 By contrast, programs like Saybrook University’s program in organizational systems are focused on supporting the integration of personal well being, community health, effective institutions, and a thriving natural environment. Such educational programs develop systems thinking skills that help people learn how to change the parts while seeing the impact on the whole system. The ability to bring people together, to engage in conversations that address different perspectives and find common ground, is another critical change leader skill. Educational programs in sustainability can and, indeed, must also actively pursue partnerships to help provide resources to their local communities. While there are fewer institutional barriers to transformative change at the local level, there are psychological ones – organizing for third order change demands a different way of thinking about the relationship between self and society. Full engagement of citizens requires that each person and family shift their thinking from “taking care of my own” to “taking care of our community.” This shift recognizes that without a thriving community, individuals and families cannot thrive. This same shift in thinking is needed in business, education, and government. Community partnered with business to determine what products and services are needed? Education partnered with community and business to bring the resources needed? Government partnered with community and business to determine how best to support a sustainable community? As a long time community activist, Larry Tackett believes that “once we come to realize that we are a part of the whole living system of the Earth, we won’t continue to go to work each day and take actions to produce profits at the expense of everything else. We will come to realize that we still live in the community that our business decisions affect. So we must take our humanity to work with us each day and bring it back home.” And we must find and demand the time to get involved in our local communities. Empowering citizens to act together in support of community transformation is critical. Only by providing many people with the knowledge, skills, freedom, and authority to act can we address the urgency of this need as so powerfully communicated by the Four Years Go campaign. The time is NOW. We are the People who can lead the change. NOTE: This post was originally published by the blog Triple Pundit on June 1st, 2010, and was co-written with Larry Tackett, who is president of Sustainable Novato.